The once lowly hunk of beef has eclipsed pork and ribs to become the power-player in the 'cue circuit. 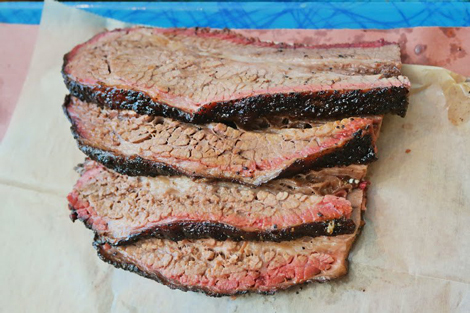 Maybe the reason President Barack Obama jumped the long line at Austin’s Franklin Barbecue last year was fear that the restaurant would run out of its fabled brisket. If so, who could blame him? One bite of the unctuous beef reveals why the lowly hunk of cow chest has become the darling of the barbecue world. Once associated solely with Texas, the meat is so commonplace that it is harder to find a barbecue restaurant in the country—even in full-blown pig territories—that hasn’t added the Lone Star icon to its menu. It’s not pork’s fault. Whether whole hog or shoulder, chopped or pulled, pork’s flavor is more subtle than beef’s, less wham-bam to the palate. Appreciating a glistening mound of chopped smoked pork is small-ball to beef’s power game. Do not read that as a backhanded compliment to pork. It is a compliment, period. And, to be sure, pork has returned to favor in Texas. But people don’t talk about about pork coming to Texas as they do about brisket coming to, well, everywhere, from Brooklyn to Portland, to even that citadel of swine, North Carolina. Why? The enormous primal flavor that, in comparison, makes steak taste like tofu. It isn’t flavor alone that propelled brisket to national-class status, though. From technological advances to major cultural shifts, there are several other reasons why brisket became the apple of the BBQ world’s eye, including something that no one really talks about: Brisket isn’t any harder to make than any of the other barbecue meats. 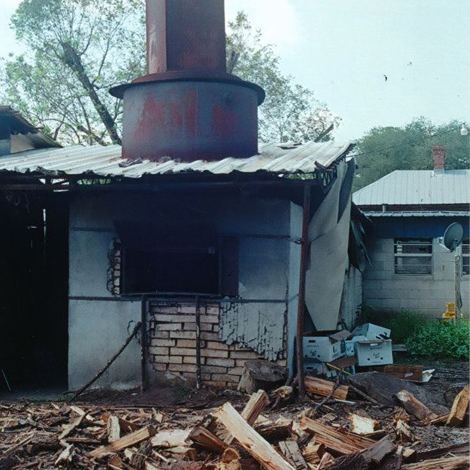 To borrow a phrase from ‘cue author John Shelton Reed, with the increased use over the past 20 years of Ole Hickory and Southern Pride wood-enhanced gas ovens, the laborious, low-paying job of tending the fire for 12 or 18 or even 24 hours was suddenly a thing of the past. A restaurateur could buy one of these behemoths, put God knows how many briskets and other meats in them, set it, and forget it. The meat took on just enough smoke to pass for a reasonable facsimile of the real thing, especially to those who didn’t know better—like New Yorkers. Gradually, the oven-jockeys (I can’t bring myself to call them pitmen) learned the nuances of the equipment and the wood and started turning out some good-by-any-standard barbecue, including moist, smoky brisket. Even in Texas, oven-smoked barbecue has become so prevalent, and so good, that several of the restaurants using ovens landed in the prestigious 2013 Texas Monthly Top 50 BBQ Joints. If technology helped spread the availability of brisket by making the cooking process easier, it was a Luddite backlash that created its current heaven-lit aura. Actually, the idea wasn’t anti-oven so much as it was pro-authentic—a subtle but important distinction. The high priest of what ultimately became a movement was, of course, Austin’s Aaron Franklin. Franklin was by no means the only guy smoking brisket in all-wood pits, not by a long shot. Great brisket existed in Texas before Franklin at places like Louie Mueller Barbecuein Taylor and Kreuz Market in Lockhart. Otherwise, it would not have achieved the status it already had. 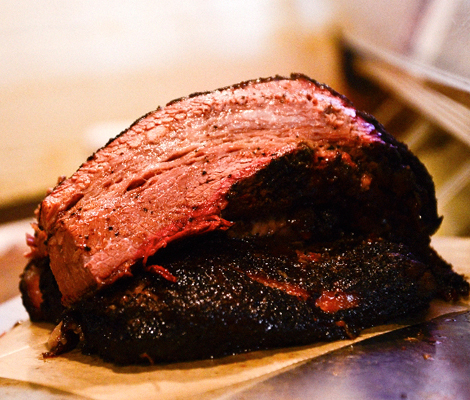 Franklin’s success spawned a cult of brisket nerds. Yet something was in the air that made people clamor for this more-perfect brisket by a bespectacled former rock drummer who honored the ways of the ancients while trying to improve them. In late 2009, he opened a trailer and word spread of what Texas Monthly called a “barbecue savant” capable of “mystical accomplishments.” Franklin’s endless tinkering with trimming the meat, and placing it just so on the grates and channeling the fire for maximum crunchy bark (crust) and luscious, gelatinous interior, created a truly extraordinary, umami-rich eating experience. Franklin’s success spawned a cult of brisket nerds. There is now even a two-day Camp Brisket co-sponsored by Texas A&M’s Meat Science Division and the Texas Foodways Alliance. Last year, it sold out in less than five minutes. The hysteria in turn, helped spawn a mythology not only about Franklin, but about his signature product, brisket. Which brings us to the mystery of culture-meets-subculture phenomenon that we call zeitgeist. Franklin came along at just the right time, when the barbecue craze was still peaking. It began in earnest after 9/11, when, it was said, Americans sought simplicity, authenticity, a sense of community—all of which barbecue provided. New York’s Blue Smoke, a harbinger of the new urban barbecue trend, opened a year later in 2002. 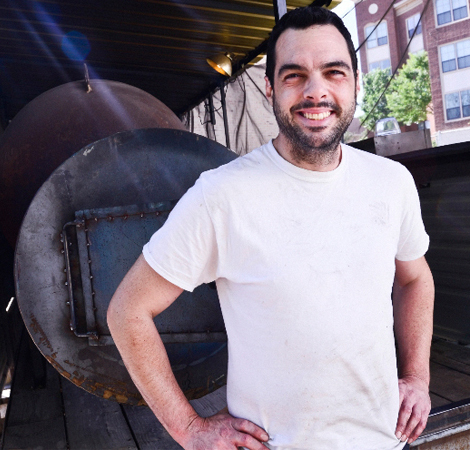 Culinary Institute of America graduate Adam Perry Lang caused a splash when he opened Manhattan’s Daisy May’s BBQ USA a year later and flexed his chef cred. Other barbecue restaurants followed in quick succession across the country, including, notably, Detroit’s Slows Bar B Q, which functioned in part as the lynchpin to a neighborhood revitalization project when its doors opened in 2005. 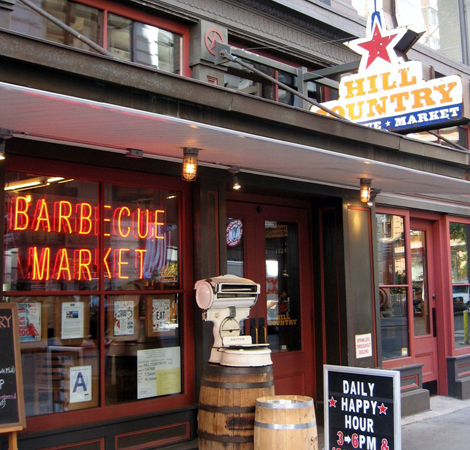 But it may have been the 2007 opening of Hill Country Barbecue Market in New York by the grandson of a Kreuz Market-loving Lockhart, Texas resident that took brisket out of Texas and put it on the national menu. As the country’s media capital, New York dictates what everybody talks about. And New Yorkers were talking about brisket. Suddenly, barbecue became a part of the cultural conversation. Blogs sprung up with gossip about Hill County’s Robbie Richter and other pitmen; forums debated the finer points of temperature maintenance and wood types. Barbecue was as much a New York culinary obsession as bagels and pizza. As the country’s media capital, New York dictates what everybody talks about. And New Yorkers were talking about brisket. Of all the reasons brisket has conquered the barbecue world, one may be a dirty little secret: good brisket just isn’t as difficult to make as its mythologists would have you believe. I’ve eaten, and made, countless briskets over decades of barbecue adventuring. Some were bad, some were mediocre, some were great, a precious few were transcendent. The same could be said, though, for my experiences with chopped pork and ribs. As more and more barbecue restaurants nationwide and thousands of backyard guys are finding, turning out great brisket is about equal to turning out great anything else. Take pork shoulder. Few talk about how challenging it is to do right. But I have eaten—and made—plenty of awful pork shoulder. It can come out stringy or dry or ropey or greasy. It can be over-smoked (less of a problem with the considerably less-delicate brisket, which loves smoke). And unlike brisket, which is traditionally smoked in an offset unit, thus allowing for relatively easy additions of wood to maintain temperature, the real-deal pork is often cooked over wood that has been burned down to embers and shoveled beneath the meat. Try doing that at home. And we’re not even beginning to talk whole hog. Some folks say whole hog cooking is easy because of the animal’s fat content, thus making it almost impossible to screw up. This, of course, is ludicrous. There are so many parts to a whole hog that cooking each one just right while getting the skin to that perfect crispness is a feat of Olympic proportions. In fact, brisket, with its fat and collagen, which, when smoked slowly for a long time, turns creamy and delicious, is, in its way, a similar process. Except it’s much smaller and has fewer separate cooking aspects (ham, shoulder, loin) to worry about. That doesn’t take away from the fact that brisket is basking in a golden age. The only downside? Much higher prices. Call it the cost of popularity.